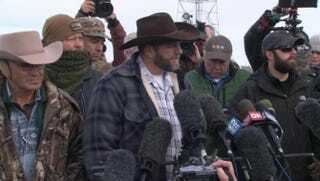 Ammon Bundy (center) addresses the media in Oregon. Who is this #YallQaeda you’re talking about? On Saturday, a group of anti-government militiamen—armed to the teeth and ready to fight to the death—took over the federal Malheur Wildlife Refuge after a protest in Harney County, Ore. They were apparently upset because two ranchers—Dwight Hammond Jr. and his son, Steven—had been convicted of arson. The leader of this group is Ammon Bundy. You might recognize that name because his dad, Cliven Bundy, is the rancher who was in the news in 2014 because of a standoff he had with federal agents. The elder Bundy also doesn’t recognize the government. Or laws. Or even black people being actual people, since he has repeatedly said things so cartoonishly racist (like “ … are they better off as slaves, picking cotton and having a family life and doing things … ” ) that you have to Google multiple sources to confirm that they’re actually true. And it’s not a leap to suggest that the apple hasn’t fallen far from the tree. Anyway, #YallQaeda is the name given to the group by people on Twitter, spurred in part by the reluctance of the mainstream media to refer to these people as who they really are. Ah, I see. So, after these guys were hunted down, shot and killed—and then arrested after being shot and killed—what happened next? Oh, I thought I was clear. Let me rephrase my question. What happened after the federal government stormed the building and arrested and/or killed these armed terrorists? I mean, if some unarmed and nonviolent protesters in Ferguson, Mo., brought out the National Guard and police officers dressed like they were about to invade Saturn, of course, actually armed and trained anti-government militiamen taking over a government building were met with full military force, right? That is what happened, isn’t it? Actually, no. As far as I know, there have been no shootings, no beatings and no arrests. I’m not even sure if the police there are aware any of this is happening. You’ll probably find more Oregon cops today at a Portland-area Krispy Kreme than within a 10-mile radius of the wildlife refuge. That’s … interesting. A few black protesters with signs and sneakers brought out the armada, but these guys with rifles and Wranglers—guys whose entire existence is predicated on saying “F—k you” to America—brought out police crickets. Well, I do have to say that it’s a bit more complicated than that. While many of the militia members are armed, this has been a peaceful protest. And law enforcement has responded in kind. The issue that many people—particularly many black people—are having, though, is about that juxtaposition. It’s not that we want law enforcement to treat the militia the same way protesters in Ferguson, Mo., and Baltimore and other cities have been treated. We just see how they’ve been treated by the police and by the media, and think, “Damn. That must be nice.” The goal of protesting injustice isn’t to make injustice more commonplace. It’s for everyone to receive the same justice. The same compassion. The same consideration. The same benefit of the doubt. Understood. So, what’s the connection between this and “white tears”? You’ve explained before how Abigail Fisher is an example of them, distilled. What’s the link here? As I stated before, “white tears” is a phrase to describe what happens when certain types of white people either complain about a nonexistent racial injustice or are upset by a nonwhite person’s success at the expense of a white person. In Fisher’s case, the connection is obvious. Fisher—a woman so average, her name should just be Darth Average—was upset she wasn’t able to get into the University of Texas, and she blames this on a racial injustice. With the militiamen, the link is a bit less obvious because there’s no direct reference or connection to what black people are or aren’t doing. But these men live under the collective personal edict that the country and their rights are being taken away from them. That they are losing, despite the fact that by being white and male and landowning and armed, they’re winning by every conceivable measure. And when people like this believe that they’re losing, the “winners” in their minds are usually people of color, who are “getting” all the things the federal government is “taking” from them. Which always comes as a surprise to me, because I go to my mailbox every day to check for my federal-government-related winnings and I come up empty every time. So either they’re full of s—t or every black person in America besides me is receiving this check.